Arliss Bunny's Blog | Biting commentary on politics, economics and litterboxes. From Arliss’ Staff: I am only a very occasional blogger and I originally started this blog as a test balloon to see if I wanted to start blogging on behalf of the company I own. I had intended to blog for one year and then make a decision. If “yes” then I would stop blogging here and start blogging for my company, if “no” then I would just stop. Ultimately, I decided not to blog for my company but as it turns out, the internet is the Wild West and Arliss definitely had a mind of her own. 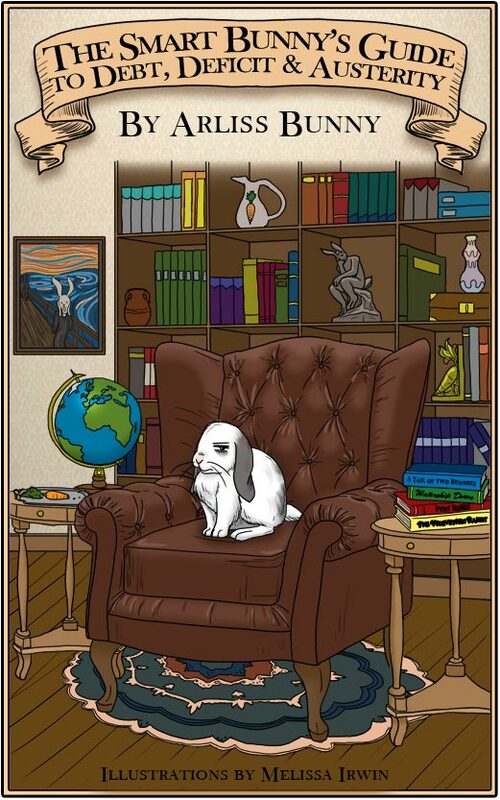 Arliss was a smart and fabulous rabbit who came to live with me for a year when her permanent staff was working overseas and was unable to bring along a house rabbit. Arilss disapproved of everyone. She especially disapproved of being abandoned in “Just to the Right of Nowhere” for a year. She was bold and brave in ways you cannot imagine a prey animal even considering. Arliss did not back down. She was always right and she was more than capable of getting her way the far greater majority of the time. As a foster home volunteer for the House Rabbit Society for many years I have known many, many rabbits and none of them were anything like Arliss. When Arliss left me to return to “the capital city” as she thought of Indianapolis, she continued to use me as her communications secretary. 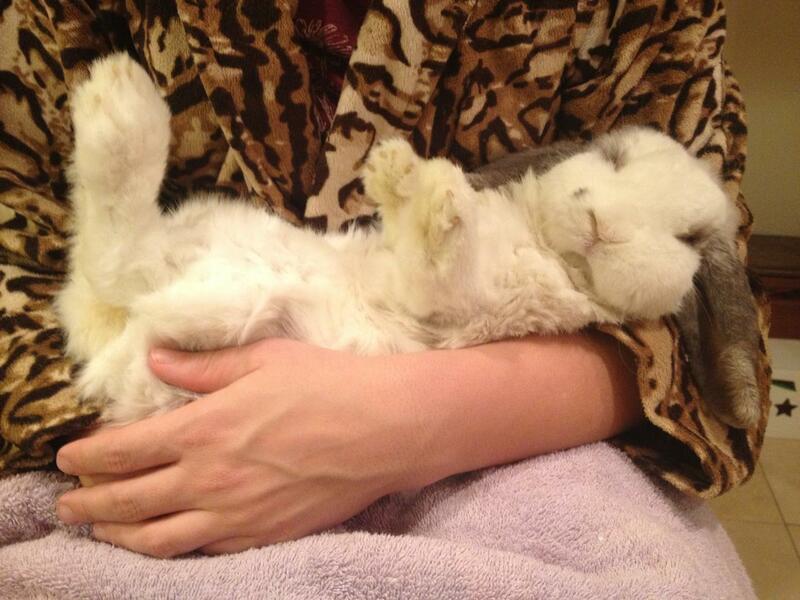 When she hopped over the Rainbow Bridge, at age thirteen, not unsurprisingly little changed. Arliss’ voice could not be diminished. When I first started blogging I assumed that, naturally, Arliss’ person might read it and my immediate family might read it (no guarantees there) but, really, who else would care? I blogged about Arliss’ thoughts on rabbit things. I learned to insert graphics, links and polls. For the most part I was just trying out the tools that WordPress offered at the time (it’s SO much better and easier now). Then something happened – Sufi Muslims wanted to build a community center and a small mosque two blocks from the site of the World Trade Center and the GOP went insane. I mean bat-crap insane. The outcry annoyed me greatly but the foolish made the mistake of pushing Arliss too far and that was the beginning of blogging on politics. “Shut-up About the Mosque Already! [With Helpful Illustrations]” turned out to be only the tip of the iced carrot. From there Arliss went on to posts like “Sarah Palin is a Communist Spy” (written in the innimicable style of Glenn Beck) and “John ‘Cheeto’ Boehner Has a Problem.” This latter turned out to be especially prophetic in that, as the years since have proven, John Boehner made the unfortunate mistake of getting precisely what he asked for, a whole (tea) party of entitled, incendiary idiots. We went through an election cycle. I continued to blog occasionally and life continued to hop along as usual – and then something else happened. There I was, minding my own business, driving into Cincinnati and listening to Sam Seder’s, The Majority Report, on Stitcher radio. Sam interviewed Dr. Stephanie Kelton, an economist, and she talked about something called “Modern Monetary Theory (MMT).” I got curious. When I got home I started reading. Most of what was available was written for economists by economists but eventually I found a way in and I buried myself in it for several days at the end of which I wrote, “Modern Monetary Theory vs the Fiscal Cliff.” And that is how IT all started. I continued to read and listen to MMT podcasts and YouTube posts and, basically, everything I could get my paws on. It was an immersion. Every so often I would put up another post. I initially posted here at WordPress but there was a more energetic community over at Daily Kos so I started posting there. Only today have I reposted things from there back to here and in all cases if you want to follow the often very vigorous discussion threads you need to click the link and head back to dKos for all of that. Eventually, I wrote, “The Smart Bunny’s Guide to Debt, Deficit and Austerity,” as an e-book available on Amazon. Next up were regular weekly (Thursdays), and later twice weekly (plus Friday), guest spots on “The After Show” airing on Netroots Radio. By this time virtually all of my public output was related to economics – and I was having a blast. Well…Arliss was having a blast. She became the Netroots Radio Monetary Policy and Financial News Burrow Chief. Of course. On “The After Show” on Fridays Arliss was always paired up with Will McLeod and that turned out to be a great combination. Will is a smart, well-spoken, millennial guy and Arliss enjoys being in good company. After about a year of that Will and Arliss agreed to take the next step and on 21 September 2015 the first episode of “Hopping Mad with Will McLeod and Arlliss Bunny” will air at 8AM Eastern on Netroots Radio. Excitement is building here and we can’t wait to begin this next adventure. Sometimes life really is a bowl of endive! Keep hopping for my partially exasperated, partially funny take on the candidates you won’t be hearing from for very much longer. The GOP Kid’s Table debate: where good facts go to die. Carly Fiorina “won” and she did it without having to use a single accurate fact. Politifact verified that. Zip. Zilch. A perfect zero. Lindsey Graham made a serious attempt to win at GOP bingo by hitting as many off-topic code words as possible in the shortest amount of time but then he basically dissolved into talking about his sad, sad life and ended up looking like he needed a hug…from John McCain. The Kids Table Debate was the debate of NO. No on immigration. No on the economy. No on healthcare for anyone but especially no on healthcare for women. No on Dodd-Frank. No on Common Core. In fact, no on the whole Department of Education. No on the EPA. No on preserving Medicare. No on taxing those who can afford to pay taxes. No on entitlements but we’ll make it up by funding defense programs the DoD doesn’t even want. But, to be fair, there were exceptions. Yes on Keystone XL, yes on “the fence,” and yes on killing women to save fetuses. Yes on tax cuts for everyone except working families. Yes on endangering social security. Yes on forcing China to act only in its own interests. Yes on backing Russia into a corner. Yes on blowing up all our relationships with all of our allies…except Israel. And yes on war with Iran. These are people who live in a world of magical thinking and I don’t mean ambitious thinking, I mean unicorns are dancing the can-can under a rainbow magical thinking. These are folks who think that racing our economy to the bottom such that we can attract manufacturing jobs back from China is a good idea! I’m thinking, why stop there? Let’s use the Second Amendment to springboard into a hunting and gathering economy. Right! Are you with me? These are people with minds and hearts so small and so focused on their own personal glory that they plan to repeal every single executive order President Obama has signed since entering the Presidency with no consideration as to what those orders might be. They only need know that they were signed by the black, Kenyan, Muslim, vegan, satan. These are truly six-shooter minds in a fully-automatic world. These are people who think that political correctness is a problem but the seemingly daily murders of citizens by law enforcement is not. And in closing – none of them can count. People, they asked you to describe Hillary in two words. Two words, people! TWO WORDS! Actually, no, I take that back because I do have a question for the candidates and it is this: if you were so easily fooled by a clearly doctored video that purports to show Planned Parenthood employees saying things they did not truly say, how can you represent yourself as someone capable of evaluating conflicting intelligence reports which may or may not directly effect national security…on a daily basis? I should begin by telling you that as I write this I have my browser open to the website of The Guardian because, quite literally, there are updates every few minutes on the exceedingly dynamic crisis between the Eurozone (EZ) and Greece. Throughout the day, as much as possible, I will add updates at the very bottom of this diary. Finally, I (aka Arliss Bunny) am the Finance News and Monetary Policy Burrow Chief for Netroots Radio and on The After Show I have covered the topic of Greece several times in recent weeks including here and here. I also went into great detail today regarding the developments of the past week. That podcast will be posted around 8PM EST today and I will add the link here when it is available. Will McLeod covers the political side of Greece on The After Show here and here. Will combines both passion and knowledge so his podcasts are not to be missed. Keep hopping for background and a play-by-play round-up of events which I have named, “As the Euro Turns.” It is an incredible story full of drama and suspense so join me. I do recommend taking a break right now to get a snack as it’s going to be a long read. It is easy to think of Greece as a small country and it is but as deflation rises and austerity continues throughout Europe, Greece finds that it is not as alone as one might imagine. Greece, Spain and Italy collectively have a population of 100 million which is one-third the population of the entire Eurozone. In Spain and Italy, in particular, upcoming elections are favoring the anti-austerity parties and current governments have not failed to notice. On 24 January, the day before the Greek elections, the leader of Podemos, the one year-old anti-austerity party now leading in the polls in Spain, made a speech that should have kept all the austerians in the EZ awake all that night and the next as well. The current government in Italy has also been signaling ever-closer sympathy for Greece. Even in Portugal, Ireland and France, where the governments remain pro-austerity, the people and opposition parties are increasingly eschewing austerity. Loudly. If you have not been following the Greek crisis, here are some general statistics that will baptize you instantly into the “Wow! It’s hard to believe the EZ could be so wrong and STILL remain unwilling to drop austerity” club. Since the imposition by the Troika (the European Central Bank, aka the ECB, the International Monetary Fund, aka the IMF and the European Commission aka EC) of starvation austerity onto Greece, the Greek gross domestic product (GDP) has fallen by 25%, general unemployment has risen to 26% and youth unemployment has skyrocketed to 55%. Even more chilling, of the €254.4bn in loans from the Troika between 2010 and 2014, €29.3bn has gone into Greek operating needs and the Greek contribution to the EU stability mechanism while the other €225.1bn has gone to pay debt. So, of the loans made to Greece, only 12% has gone to the citizens of Greece. The rest has gone to pay German, Dutch and Austrian banks as well as the Troika. When you hear people talking about a Greek bailout they could not be more wrong. This is a bailout of the creditor banks, pure and simple and it means that German Prime Minister Angela Merkel has a €320bn gun to her headso how ever tough she wants to sound, Greek bankruptcy and Greek exit of the Euro (known as “Grexit) would splash her sticky, bloody brains all over Germany. Don’t imagine, whatever the rhetoric, that Merkel is unaware of the consequences. On 25 January, by huge margins, the Greek people put a new party, SYRIZA (it’s an acronym) into power and while SYRIZA is called a “radical leftist” party they actually are not. They are a center, progressive party. What makes them seem “radical” to the northern Eurozone is that they have accepted and proclaimed the reality that austerity does not now and will not ever work…in Greece or anywhere else. Also widely misunderstood, SYRIZA does not want to leave the euro or the European Union (EU). They simply want the freedom to implement proven growth strategies (rather than disproven austerity) in order to reverse the destruction of their economy. “(my party) is not a ‘threat to Europe’ but instead a force for change in its policy direction.” Tsipras and his Cabinet are planning to lead not only Greece but to blaze a path for other seriously jeopardized EZ member nations…and THAT is why the Germans fear him. Tsipras is, btw, a thoughtful, dynamic, strategic thinker and deserves an entire dKos diary dedicated to him and to the rise of SYRIZA. That will, however, not be a diary written by this rabbit as I am more of a monetary policy wonk than a political junkie. Because Varoufakis is so central to all that is happening right now I will add a bit more detail about him so that you can get a clear picture of who he is. First of all, immediately following the Greek elections, he started a whirlwind of meetings in EZ capitals with his counterparts. He never wears a suit or even a tie even when speaking at the House of Lords. It caused a flurry of glee in the British press when he showed up to meet with British Chancellor of the Exchequer, George Osborne wearing black jeans, an untucked shirt open at the collar and a leather jacket. The Guardian happily pronounced his attire “something Putin might wear on a bear hunt.” The Guardian further speculated that a suit would have conveyed “get comfortable I want to join the club” and that Varoufakis does NOT want to join. The Guardian surmised that Varoufakis wants them terrified and that this is the Greek way of signaling, “You can’t get blood from a f$&^ing stone so get real.” (This latter is my interpretation of their thought.) Varoufakis later said, in an interview with Stern, that he isn’t comfortable in suits or ties, he has never worn them and he isn’t about to start now. He has both Greek and Australian citizenship and has taught in Athens and Australia but most recently was teaching at the University of Texas at Austin. All of this change is so recent that his wife is still in the States packing and making the arrangements to move back to Greece with their son. The Varoufakis family moved to Austin following a death treat made, via phone, to Varoufakis wherein the life of his son was threatened. Varoufakis had been involved in unearthing bank fraud and corruption prior to the threat. Varoufakis runs a popular blog and intends to continue to do so though with shorter posts. He is also extremely active on Twitter (@yanisvaroufakis) and is a great follow. Another new member of the Greek government is Deputy Minister of Labor and Social Solidarity, Rania Antonopoulos. Until her appointment Ms. Antonopoulos was a senior scholar at the Levy Institute of Bard Collage, one of the true homes of modern monetary theory (this is a different link than the last one). Antonopoulos has also been an advisor to the UN Development Program. One of Antonopoulos’ areas of expertise is job guarantee programs. The program she has designed for Greece over the past two years is the one that SYRIZA will be putting in place under her direction. The Levy Institute has been deeply involved with SRIZA over the past several years and its director, Dimitri Papadimitriou, has been flying to Greece every few months to lend advise. Still hanging in there?…Perhaps a refreshing sip of carrot juice is called for. I’ll wait. The core principle of the SYRIZA Plan is to put ordinary Greeks first. They mean to prioritize the 99% over the 1% and they have minced no words on that score. Among the ways they are planning to generate additional taxes is by clamping down on the off-shoring of income by the wealthy. They have a huge database already warmed up and they mean to use it. They are also going to break-up cartels and clamp down on criminal banks. And they aren’t just saying this, they are already preparing the first steps. They remain strongly committed to their ECB and IMF loan obligations though, in carefully worded statements, Tsipras seems to be speaking less to the loans made by other nations and while this infuriates the creditor banks, when in bankruptcy having clear priorities is always wise. From the beginning SYRIZA has been fully transparent regarding its actions and intentions so stating their priorities out loud is an expression of their commitment to deal honestly. As far as debt goes, the breakout is as follows: €142n is owed to the EZ/IMF fund (these are speciality instruments raised only for the purpose of resolving various crisis), €53n to individual countries, €20n to the ECB in Greek government bonds and another €50b is owed by the Greek National Bank to other national central banks through the EZ payments system. If you are interested in knowing how Greece got into this situation in the first place and you guess international corporate terrorists Goldman Sachs you would be a long way to right. I did a podcast on that too and it is here. While many/all believe that it is impossible for Greece to service their crushing debt load, there are some considerations that most fail to notice. (Again, hat tip to Frances Coppola for this analysis.) Greek debt already sits well below market rates and has a very long horizon for repayment. In fact, no principle payments are required on the European Financial Stability Facility bonds (EFSF bonds), mentioned above as speciality instruments, until 2022. Debt service for these primary creditors is 2.6% of GDP, so not entirely unaffordable. The current debt load is, however, 175% of GDP and some EZ idiot (achtung! pardon my sneeze) insisted that the 2012 agreement between the EU and Greece require that Greece reduce its debt load to 120% of GDP in three years! This already impossible task is made even moreso because as the Greek economy shrinks (it’s down 25%, remember) the debt to GDP load naturally floats up. The real problem for Greece is not debt service but what is being called the “current program,” (aka “structural reforms”) the conditions Greece is required to fulfill in addition to repaying its debt. This is the tool the Troika used to impose “fiscal waterboarding”, to steal Varoufakis’ descriptor, on Greece. The “current program” includes the % of GDP requirement noted above and, even more damaging, the random edict that Greece must run a primary surplus (meaning not including interest payments) of 3% this year and 4.5% in 2016. I’ll say it again, that is the equivalent of a $720B surplus in the United States and it is insanity. In fact, it’s worse than that, it is built-in failure and everyone knows it. The 2012 agreement, to which the Germans are attached as firmly as a crustacean to a boat hull, was never intended to work. Oh, and the so-called Troika monitors, that the IMF and ECB are foisting upon the Greeks because the Troika are determined to treat Greece as a junior, less-than, not-quite-partner. For confidence you need LOTS of unicorns. In my book, I refer to this as the “Wussing, Wussie, Wusses – Business Confidence” problem. Folks, write this down on the inside of your eyelids; business never leads. Business follows. Business NEVER hires a single employee it does not desperately need at that very moment. Period. RABBITS have figured this out. You plant a carrot seed and when it sprouts we eat the top off. You plant another seed and we eat another sprout. It’s not a carrot until it’s a carrot, people. HOLY CRAP! Even Kenneth (I can’t manage an Excel spreadsheet) Rogoff gets it. How much more simple can it possibly be?!?! Given its action in the EU, the German point of view is neocolonialist, at best, a new Reich, at worst. The current German surplus far exceeds even the upper limit for surplus as recommended by the ECB and this is important…. Because there is ALWAYS BALANCE German surplus = debt for others. Period. It’s accounting and we all know you don’t screw with the Math Gods. Greek loans are all about bailing out Germany. Meaning TINA (there is no option to austerity). Back in the real world, austerity is the proven cause of the continuing Greek decline – not debt, not deficits. In fact, the deficits are too small. A significant fiscal stimulus is essential for Greece to move forward. SYRIZA understands this. Meanwhile, from their lair under a volcano, top German politicians are demanding that Greece sell islands in order to bail out German creditors. Bwhahahaha. Thursday, 5 February: Storm clouds began to rage in the EZ when SYRIZA kicked out the Troika monitors who had been deployed to watch over the shoulders of the Greek government dispensing discipline and austerity at will. SYRIZA had promised, during the election, to throw the monitors out and they did so. The ECB, in a tantrum rage and without required consultation, immediately “lifted the waiver” under which Greek government bonds had been allowed to trade. Prior to this the ECB had agreed to accept Greek government bonds even though Greece did not meet the ECB minimum requirements. A formal waiver was in place to allow the transactions and it was this waiver that was pulled by the ECB in a fit of pique. Friday, 6 February: the ECB clarifies that Emergency Liquidity Assistance (ELA) funding will still be available to the Greeks but, of course, the strings on that money are many and short. Sunday, 15 February: EC President Jean-Claude Juncker (of Luxembourg) announces that he has taken a “personal stake” in the negotiations and is making a “last-ditch” effort to resolve the differences. Tsipras and Varoufakis seem confident that they will come to agreement with EU finance ministers based upon the draft communique they have been given by European Commission’s Pierre Moscovici, called, cleverly, “the Moscovici Draft”. The Moscovici Draft contains no commitment to the “current program”, and instead refers to a “new arrangement”. The Greeks say they are “happy” to sign this “splendid” draft immediately. Moscovici calls upon EU finance ministers to be “logical and not ideological”. Ummm…fat chance. Because things are not already screwed up enough, the third draft is translated, by the Eurogroup, to include “in line with” language but Greeks have been given a translation that means “along with”. Obviously, these are two completely different meanings. …because otherwise the Germans will be right back here again with my country after our elections. Wednesday, 18 February: Per the recommendations of Tsipras, the Greek Parliament elects pro-European conservative, Prokopis Pavlopoulos to be the (largely ceremonial) President. This is a cross-party hat-tip and further unites the Greek people. Greece announces plans to ask the EZ for a six-month bridge extension but not under the full “current program.” Greeks plan to propose a new bridging program to keep things going for six months and to pay €7bn in maturing bonds. He means austerity and he is…so…very…wrong. Germans are publicly pressuring the ECB to deny further ELA funding to Greece believing the hard line will signal other anti-austerity movements that they had best not try it. Still, it is doubtful that ECB will cut-off ELA because it signals that ECB is not backing national banks and in such a sensitive environment this might cause other national banks to experience large cash outflows. And a new poll backs him up: 79% of Greeks support the government and 74% believe their strategy will succeed in the end. Thursday, 19 February: Greece formally requests a six-month extension and, as a short-term compromise, they commit to maintain fiscal balance during renegotiation period, take immediate measures on tax evasion and corruption, agree to meet all financial obligations in the interim and to refrain from unilateral action that would undermine fiscal targets. In a HUGE concession, they agree, during the extension,to be monitored by the Troika again. They do not agree to a 3% budget surplus. They also stand firm on addressing their humanitarian crisis and their plan to kick-start growth with stimulus. Germans reject the Greek proposal out of hand. (Don’t worry, there’s an extra hot corner of hell waiting for this guy.) In the meantime, it is worth knowing that the current Board mix of the ECB is very anti-Greek but the Board rotates and the composition of the March Board is much more likely to be easier for the Greeks to work with. …and now they have four months to catch their breath, make a plan and get it done. …and just so you know, this IS the short version. Keep hopping for a story which is both astonishing and moving. I promise. It’s also really long but you won’t regret reading through to the end. I promise that too. Meanwhile, things at the Federal Reserve Bank of New York weren’t just chaotic, they were terrifying. Even before the first tower fell Protection staff had locked the vaults, secured the facility and cleared the street in front of the Fed for emergency vehicles. Key personnel equipped with special frequency radios were in touch with the FedNY back-up location in New Jersey letting staff know that there was an emergent situation and to prepare for accepting the operational responsibility of the Bank. Down in the lobby Protection staff began to pull in injured pedestrians so that they could be treated by on-site Fed medical personnel and as the towers fell this trickle of pedestrian refugees became a flood. Someone on the physical plant team thought to turn off the ventilation systems immediately in order to preserve the air quality inside the building and Fed staff handed out face masks and wet paper towels to ash-covered survivors. Housekeeping staff divided their efforts between cleaning up as much of the ash as possible near the entry points where it was worst and cleaning the cafeteria. Incredibly, by noon the cafeteria was up and running and was providing beverages and snacks to the refugees, until they were able to evacuate, and then meals to staff and emergency responders. The Fed continued to feed fire and police personnel around the clock. The FedNY also provided space for first responder trauma counseling, a service much needed and much used during those early days. As far away as the Federal Reserve Bank of Chicago non-essential employees were also evacuating and the back-up location was being warmed up. The Fed in Chicago is one short block from the Sears Tower and while others around the country may not remember, Chicago was very much in fear of attack. Chicago staff decided not to shift to the back-up because they knew that DC and NY would need them and they felt the time it would take to move was not time the system could afford. Gordon Werkema, a Vice President at the Chicago Fed said, “Closing the Fed would be like shutting down the fire department because there are too many fires.” From their offices in Washington the Department of the Treasury Office of the Comptroller of the Currency (OCC) had issued a statement saying that banks around the nation could close early at their discretion. Several in the neighborhood of the Sears Tower took them up on it. * In the war room of the Chicago Fed one employee wrote, “JUST THE FACTS” up on the white board at the front of the room. It was going to be that kind of day. As the core employees left the NYFed all around them they could see not only the dangers and tragedy of the day but the obvious logistical issues which would have to be resolved before they or any of the rest of the financial industry would be able to return to their primary facilities. Thousands of phone lines were cut, including the Verizon lines described above. Debris damaged or destroyed not just the area right around Ground Zero but the ash had floated into electronics and buildings air systems making them non-functional. Fires and water also left their mark. Transportation and power joined telecommunications in being seriously compromised. Even more directly applicable to the financial industry was the fact that while most companies had back-up sites they had never tested all those sites working together. Beginning as early as 9-11 itself, the IT team at the NYFed started working with customers to get them back into communication with the industry. IT staff worked around the clock throughout the week and all through the extensive weekend testing for the NYSE and the Nasdaq in order to ensure that trading could resume on Monday, the 17th. They were assisted in this by employees of Verizon, Con Edison and FEMA.FEMA, the State of New York and the City of New York also prioritized sending structural inspectors out to verify the integrity of any buildings which were in question. 11 September 2015: If you were at any Federal Reserve branch between 9-11 and 9-17, please contact me via KosMail or on Twitter via@ArlissBunny. Also, since the original posting last year I have learned that the leadership of Cantor Fitzgerald had to be forced to behave as a moral human. My thanks to those who created the pressure which brought Mr. Lutnick into line.